Indian plastics industry is poised for a substantial growth in investment in new technologies with the increasing demand from various sectors such as agriculture, automobile, engineering, packaging, infrastructure and healthcare. One of the areas where more attention may be focused is bio-degradable plastics. Biodegradable plastics are plastics that are capable of being decomposed by bacteria or other living organisms. Two basic classes of biodegradable plastics exist. First is Bioplastics, whose components are derived from renewable raw materials and second, plastics made from petrochemicals with biodegradable additives which enhance biodegradation. Under proper conditions biodegradable plastics can degrade to the point where microorganisms can completely metabolise them to carbon dioxide (and water). For example, starch-based bioplastics produced from sustainable farming methods could be almost carbon neutral (although widespread adoption might result in higher food prices). There are allegations that “Oxo Biodegradable (OBD)” plastic bags may release metals, and may require a great deal of time to degrade in certain circumstances and that OBD plastics may produce tiny fragments of plastic that do not continue to degrade at any appreciable rate regardless of the environment. The response of the Oxo-biodegradable Plastics Association (www.biodeg.org) is that OBD plastics do not contain metals. They contain salts of metals, which are not prohibited by legislation and are in fact necessary as trace-elements in the human diet. Oxo-biodegradation of polymer material has been studied in depth at the Technical Research Institute of Sweden and the Swedish University of Agricultural Sciences. A peer-reviewed report of the work was published in Vol 96 of the journal of Polymer Degradation & Stability (2011) at page 919-928, which shows 91% biodegradation in a soil environment within 24 months, when tested in accordance with ISO 17556. Concentrated efforts of the AIPMA are set to fasten the growth rate of plastic consumption to 20 million tons a year from the current 8 million tons a year in India. 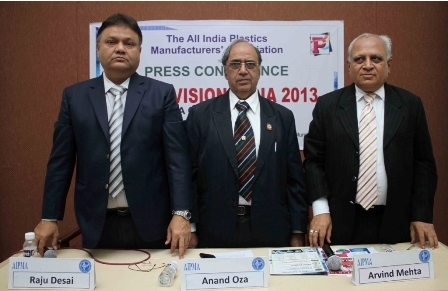 The 9th Plastivision India 2013 consisted of unique features that highlight the support received by the industry that time around. With dedicated pavilions like Indiamold, Plastiworld, Plastics In Agriculture, Automation & Robotics in Plastics Pavilion, Green Pavilion, Solar Energy Pavilion and Plastics in Medical Pavilion, this 5-day event provided an opportunity to all stake holders to view into the kaleidoscope of growth prospects of Plastic Industry. Plastics is one of the biggest contributor to India’s GDP with the growth rate of 12%-15% per annum, it houses over 50,000 manufacturers and employees of over 4 million workers in the plastics industry. AIPMA envisages a additional investment of Rs.250 billion including SMEs which will help the Industry in a big way. Currently plastic parks are taking shape in Northern India at Panipat Haryana and north Rajasthan, Gujarat at Dahej and Sanand, Karnataka at Narasapura Industrial Area, Harohalli, and Kerala. With per capita consumption of plastics expected to grow rapidly to 20 kgs by 2020 from the current 8 kgs, the processing industry is looking at growth to cater to the increasing demand from across India. Raju Desai, chairman of Plastivision India 2013 said, “We would like to contribute our share to the society and propagate that plastic is not bad, but it is waste management that needs to be paid attention to. Hence, we have also undertaken several initiatives nationally for recycling of plastics. Indeed, at Plastivision India 2013, we would be demonstrating successfully that usage of plastics is actually taking a load off our precious non-renewable resources and help the environment.” Highlighting the fact that the industry is conscious of its social responsibilities, the industry and the government need to work together on technology, innovations and infrastructure for recycling of plastics.